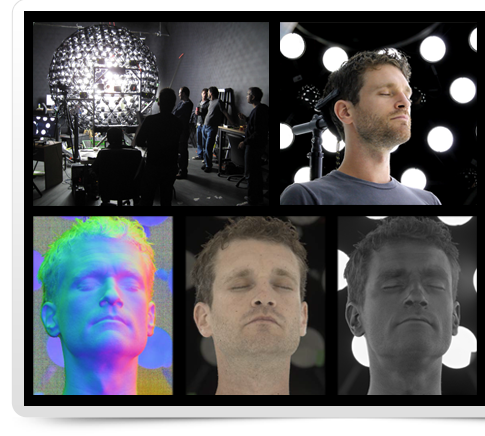 LightStage™ is a cutting-edge scanning technology that allows for the digital capture of the human face with unparalleled fidelity and scientific accuracy. LightStage efficiently captures how a subject’s face appears when lit from every possible lighting direction. From this captured imagery, specialized algorithms create realistic virtual renditions of the subject in the illumination of any location or set, faithfully reproducing the color, texture, shine, shading, and translucency of the subject’s skin. Over five million polygons from the LightStage scans provide sub-millimeter accuracy, to deliver highly detailed and incredibly accurate geometric data. Scan data cleanly separates the diffuse and specular components of the skin, as well as, highly detailed normal information. Artist-friendly mesh lets you tweak the basic geometry of your characters. Learn more about LightStage and what it offers. Take a look at LightStage in action.